In typing up this recipe, I suddenly remembered, ooops, I forgot to add the baking soda. It is a bit amazing how we can remember such a small detail of several days ago. Anyhow, rest assured that all the ingredients are listed here and they were quite successful with the little “miss”. As with most recipes I have a couple of “shares”. When I first received this recipe and in reading “healthy” I thought “is it so healthy that I would eat it for breakfast”? Breakfast is the most important meal of the day and would I jump start my system with something like this? Got to admit there is a lot of sugar and butter in it. But, in comparison to what? So although I don’t recommend “cookies” for breakfast these are a better alternative for that time of the day when I want “a little something”. It’s about moderation not deprivation and in the middle of the day if I am having a cup of coffee or tea having a healthy choice is a good thing. I recall when my competing days were done and I was making home made goodies for my family. I would be so “urchin like” and go to the point of writing down each and every ingredient and figure out the calories, grams of protein and fat for each morsel. Although I don’t do that anymore this practice did nourish an awareness as to what is in even homemade items let alone pre made boxed foods. For those busy families these cookies can be done in several steps. 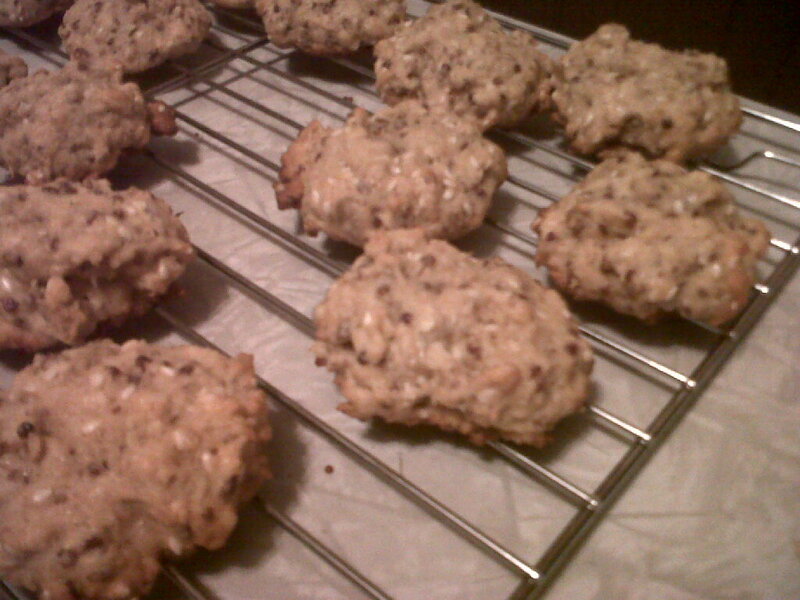 Quinoa was cooked and refrigerated one day, dough made the next and cookies the day after. Make it in double; keep the ready to eat bunch in the fridge and freeze another batch. We live by the Little Red Hen story in our home. Get the kids involved. EVERYONE contributes because they want to. Think of the love your nourishing not only in your relationships but also in the food your preparing. Be sure to read the link with the flax seed and prepare them safely. Recipes are guidelines. Get creative; ground some nuts to “up” the protein, reduce the sugar just a bit, try coconut oil in place of the butter. Bring the water and quinoa to boil in a small saucepan. Reduce to simmer, cover and cook for 10 min. Turn the heat off and leave the covered pan on the burner for an additional 6 min. Remove the lid and fluff with a fork. Set aside to cool. Preheat the oven to 350. Grease or line with parchment paper your baking sheets. Cream butter with the brown sugar in a large bowl, add eggs and vanilla. Mix well. Combine the flour, baking powder, baking soda, cinnamon and sale in a medium bowl. Add the oats, cooked quinoa, coconut, sunflower seeds, flax and sesame seeds to the flour mixture and blend well. Combine this to the butter mixture and stir until well mixed. Drop by teaspoon full using spoons onto the baking sheets. You can flatten with your hand or leave as balls. Bake in oven. If the dough is flattened the time should be 8-10 min. If the cookies are more of the ball cooking can take up to 15. After cooling on racks the cookies will keep in the fridge for up to a week. Freezes well.